The purpose of the Women Soaring Pilots Association is to encourage women to fly gliders. One way we do this is through our scholarship program. Applicants are required to be members of WSPA and if living in the U.S., members of SSA. Scholarships are offered to women of all skill levels, from beginning students to advanced licensed pilots. Persons interested in applying for a scholarship should review the list below and select the scholarship that best meets their needs. Applicants may submit only one application per year. Scholarships can be used at any glider training facility. Click on the name of the scholarship for an application form and more details. 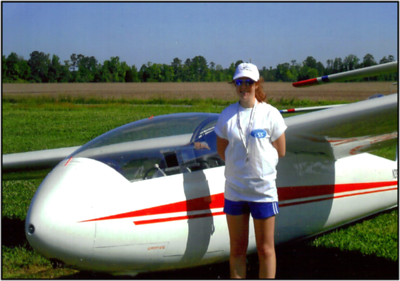 If you are a beginning student glider pilot there are three scholarships that may work for you. The Sky Ghost Scholarship is for a woman under the age of 25. If you are over the age of 25, The Mid Kolstad Scholarship would be for you. Both of these scholarships can be used at any glider training facility. The Briegleb Scholarship is for a woman of any age to help pay expenses related to attending the Women Soaring Seminar. If you want to become a CFIG, one of the following scholarships can assist you. Monique's Scholarship requires that you already have a Commercial Glider License. The Flying Montague scholarship can assist you in obtaining your Commercial license and CFIG. It requires attending a Women Soaring Seminar. The SoaringNV Scholarship provides funds for a CFIG license, but is only offered in odd numbered years. If you want advanced training in cross country, aerobatics or for obtaining badges and records, The Maria Faber Scholarship is for you. This scholarship can also be used to obtain a tow pilot endorsement if the applicant is licensed in airplanes. If you are already an accomplished glider pilot and you want to fly in an SSA sanctioned contest, The Competition Scholarship will provide funds to help pay for your expenses. This scholarship is only available to members living and flying in the U.S. Applications are reviewed by a committee of three WSPA members and judged on 1)realistic goals, 2)dedication to those goals and 3)commitment to soaring and WSPA. Mentors are assigned to scholarship recipients to offer encouragement and guidance. And, you can support the US women competing in the next FAI Women's World Gliding Championships, in January 2020 at the Lake Keepit Soaring Club in New South Wales, Australia. Three pilots are interested in going, and WSPA is kicking off a donation fund drive to help support their participation. You can donate by sending a check to the WSPA Treasurer or via Paypal; please mark your donation "WWGC Fund". And then watch the flights and results on-line!